I’ll come right out and say it: I love online dating. Having done more than my fair share of dating and I can say with confidence that there is no other medium out there that allows a girl to get 28 dates (most of them with different men) in 40 days. Between POF.com and Match.com it’s easy for a girl to find interesting men that want to show her around town. I could go on all day about how women should spruce up their profile to meet interesting men… but instead I’m going to reveal the secrets of what I (and I suspect most women), look for in a man’s dating profile. Compare the contents and information of an online dating profile to the resume and cover letter that one would send as part of a job application. This information is your chance to attract attention and showcase everything that makes you completely “dateable.” If you fail to create a profile adequately reflecting your qualities and strengths as a potential candidate, you could be getting overlooked. When women join a dating site they are, most often, looking for a lasting relationship. One of the many benefits to online dating is that it takes a lot of the guess work out of the dating scene by asking users to list their interests, qualities, hobbies and aspirations out in the open. Use this as an opportunity to really show yourself. Follow these tips when creating your profile and women will be dying to know more about you. Most (but not all) women join dating sites looking for a lasting relationship. Creating the profile for your respective online dating site is an opportunity to provide women users with a snippet of your personality. Be original! Avoid the use of clichés like “ I like to live life to the fullest” and “I enjoy romantic walks on the beach.” Those phrases are boring and more importantly, overdone. They do not provide any real information about who you are. Try to examine your life values and interests and put those things into words. Using a description that is unique, different and exciting is much more likely to catch a woman’s eye. You have some very exceptional interests and qualities that are going to be very attractive to another person. It’s time to expose them. Of course, you can’t tell someone everything about yourself through an online profile. However, you can get creative and attract attention. Be funny. Be unique. Incorporate things that are going to make you memorable. Who’s your favorite character on the Jersey Shore, and why? If you could choose one super power, what would it be? Things like this are going to stand out and the purpose of your online profile is to serve as an audition for the real show, the first date. 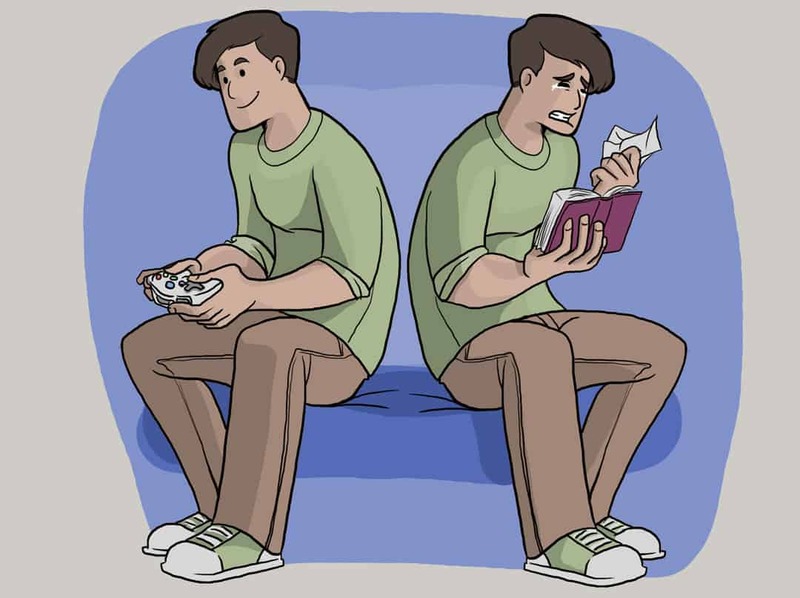 Types of men: Video games player or avid reader? Ok, guys – We women know that you spend a lot of your free time playing video games, watching sports and “broing out” with your buddies while throwing back Bud Lights. Don’t get me wrong; having the ability to be a guy’s guy is an attractive feature in a partner. However, women also like to experience your softer, intellectual side. Look at this as a time to let your sensitive and cultured qualities shine through. You may not get a chance to talk about your love for classic novels, describe your adorable cuddle sessions with your Labrador retriever or confess to crying in The Notebook, very often. These may not be appropriate topics for a poker night but we certainly want to hear about them. We want a burly, manly man with a soft spot. Give us a preview of both angles. Confidence can be a very attractive quality in a man. Women want a man that is aware of what he has to offer, knows how to use it and, most importantly, is choosing her as the recipient of this gift. However, use discretion and be careful not to create a profile that could potentially come across as vain or egotistical. Be aware of your tone in your written descriptions. State your strengths with confidence but don’t be arrogant. If you are an active individual and have the physique to prove it, we want to see that. Instead of posting a selfie of you flexing in the mirror, use a photo from a day at the lake with friends. Your abs will most certainly not go unnoticed and we will take note of your choice of pictures, seeing that your friends are important to you. She’s looking for her ideal man… is that your profile? Very often, online dating site users view their profiles as a chance to display what they are looking for in a partner instead of examining what they have to offer. It’s certainly okay to give some indication of what qualities you are looking for, as well. However, your efforts are better served describing yourself as a person and potential companion and letting women know what treatment to expect from you. You have something to offer women that others don’t. It’s time to figure out what that is and own it. Maybe you give shoulder massages second to none. Maybe you have an unusually high tolerance for chick flicks, are the perfect shopping companion or are a phenomenal listener. What makes you great? Find out what these qualities are and make sure to let women know. Not only will you be advertising your strengths as a potential boyfriend but you will also gain confidence from knowing all of the things that make you desirable. Be confident about who you are and what you have to offer. Tell the truth. One of the most sought after benefits of online dating is that profiles are used to put important information out there. Female users that may come across your profile may notice a “deal breaking” detail right away, saving you both time and embarrassment by catching it up front instead of on the first or second date. It is equally as likely that they will notice a quality that is exactly on par with what they are seeking. You want someone to give you a shot because they like what they saw. More importantly, you want the things they saw to be the real you. Be selective and deliberate when deciding which photos to include. This is not only a chance for women to see what you look like but it also allows them another glimpse into your persona. Include actions shots of you doing something fun and exciting to show your adventurous side. Have an exciting life? Show us! Consider a photo of you hiking, mountain biking or fishing. Including a picture with family and friends illustrates the importance of the relationships in your life. One word. Puppies. Posting a photo of you with an animal of any kind is likely to melt the hearts of any women who stumble upon your profile. Include photos that you may have taken on a trip to Europe or on a cruise to the Caribbean. This is the perfect chance to provide a visual representation of how diverse and exciting your interests are. When creating your profile for an online dating site it is important to be strategic and purposeful with the information that you share. Knowing what women are looking for as they browse different profiles will help you determine a plan of action. Consider these tips when deciding on which of your qualities and personality details to include in your profile. I’m here to provide you with a little bit of insight into what women are thinking as they search for the love of their life from behind their computer screen.